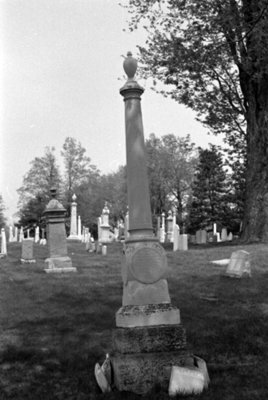 A black and white photograph of the Almond Family gravestone in Union Cemetery, Oshawa, Ontario. The inscription on the gravestone reads "In memory of James Almond, born in Lincoln Eng. April 20, 1809, died May 18, 1884. Also his wife, Lucy Todd, born London Eng. Mar. 24, 1829, died June 7, 1906. Mark the perfect man and Behold the upright for the end of that man is peace." James Almond was born at Lincoln, England on April 20, 1809. He settled in New York State and moved to Whitby Township in 1837. The settlement on lot 35 Kingston Road later became known as Almonds. James Almond donated his land for the Almonds Church. Mrs. James Almond (Lucy Todd) was born at London, England on March 24, 1829. She married James Almond after his first wife died in 1861 and lived on lot 34, concession 1, Whitby Township at the settlement known as Almonds. Almond Family Gravestone, Date Unknown, Brian Winter. Whitby Archives A2013_004_455B.